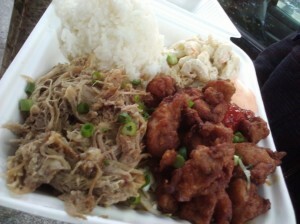 The plate lunch is a staple in Hawaiian food and can be found at restaurants and food trucks all over the state. The best plate lunch is up for discussion, however, the typical plate lunch will always come with a protein, one or two scoops of rice and macaroni salad, and sometimes a side salad will be a substitute. 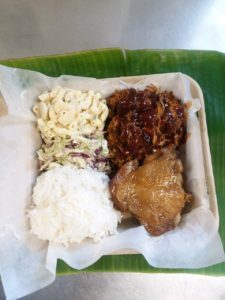 It can be expensive eating on Maui so below is a list of where you can find a plate lunch on Maui for under $10. The following are not ranked in any particular order. Kū‘au Store, 701 Hāna Hwy, Pā’ia/Kū‘au- Located on the North Shore this is one of the last stops before The Road to Hana, and is most known for their shoyu chicken plate lunch. The old Kū‘au Mart was located here and had a shoyu chicken recipe that everyone loved. The owners said that when the store re-opened they wanted to honor its past by keeping the popular dish. 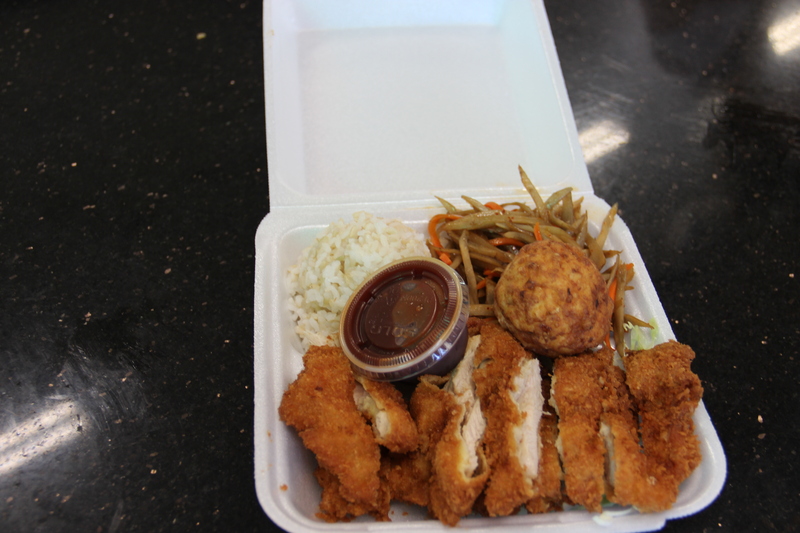 The shoyu chicken plate lunch price is $8.99 and comes with white or brown rice, and either mac salad or coleslaw. Both the mac salad and coleslaw are made from scratch in-house and the store uses organic ingredients whenever possible. The store is currently working on getting organic chicken for their plate lunch in the near-future and the best part? They say it will still remain under $10. 2. 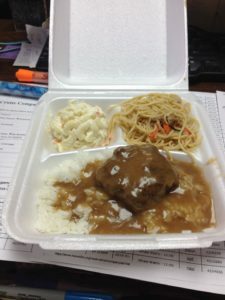 Ichiban Okazuya Hawai‘i, 2133 Kaohu St, Wailuku – This place is small but serves up some pretty big portions when it comes to plate lunches. The lunches here come with a scoop of rice (brown or white), mac salad and a choice of a side dish including noodles, steamed veggies, namasu, tofu ball, gobo, chop chae and nishime, to name a few. 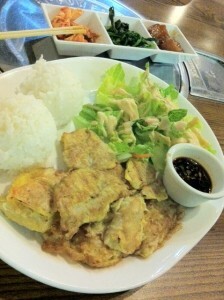 Protein options at this spot include chicken or pork katsu, curry stew, teriyaki chicken or Korean chicken for $8.64. 3. 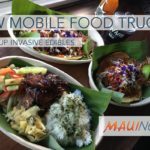 Nobu’s Lunch Wagon, 1058 Limahana Pl, Lahaina – Nobu’s is a pink food truck located in Lahaina and has a simple menu and one special item of the day. 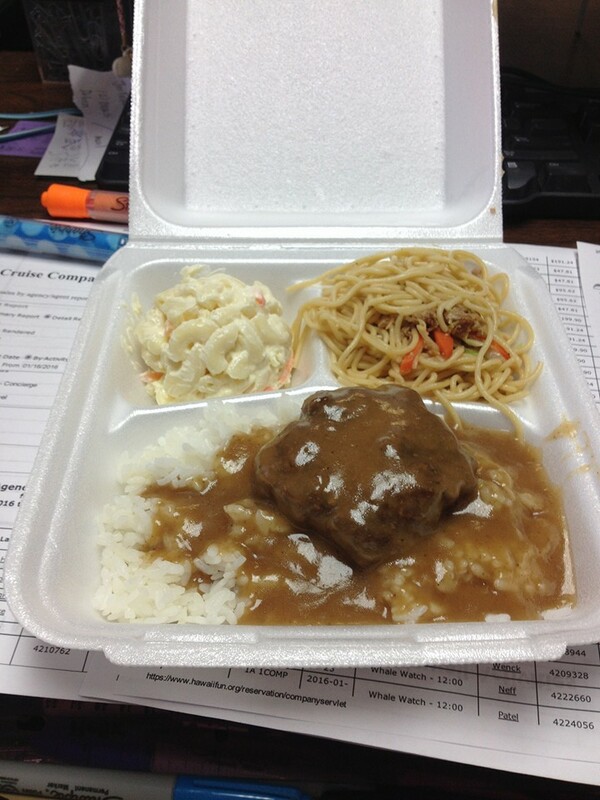 shoyu chicken, hamburger steak, beef stew, chicken curry, and meat balls are always available with a scoop of rice, noodles or mac salad or green salad for $8. Can’t decide on what to get? Grab the combo plate lunch with two choices for $8.50. Mini plates are also available here for $6.50. 4. 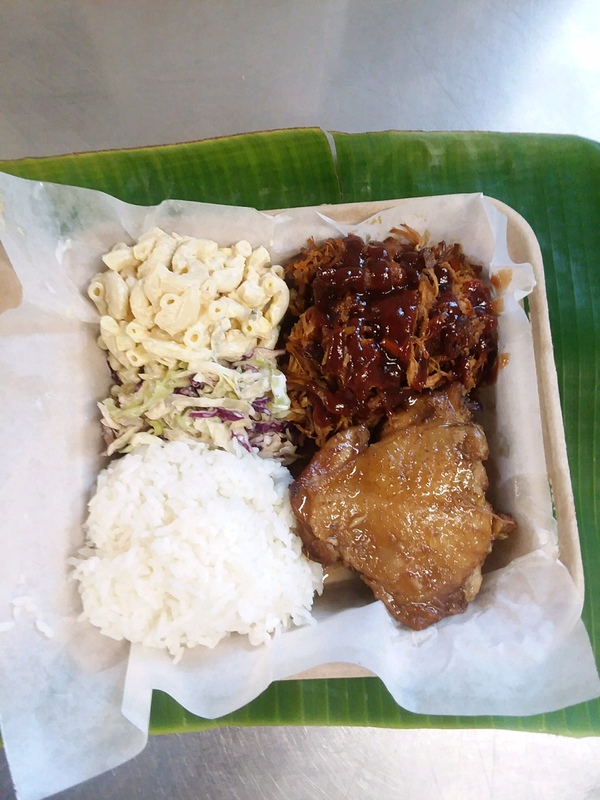 Kings BBQ and Chinese, 810 Kokomo Rd, Ha‘ikū, 1913 S Kīhei Rd, and 197 N Market St, Wailuku – With three locations on Maui, this popular lunch place serves up plate lunches starting at $6.99 for a mini plate (one scoop of rice and mac salad) and regular plate lunches starting at $8.99 (two scoops of rice and one scoop of mac salad). Some plate lunches under the $10 range include BBQ chicken, chicken katsu, fried shrimp, BBQ short rib, loco moco, meat jun and roast pork. 5. Kaohu Store, 1833 Kaohu St, Wailuku – Although this place is mostly known for its poke, it also serves up plate lunches too. Plate lunches run about $9.95 and include two scoops of rice and mac salad. This place has all the goods when it comes to a plate lunch; chicken adobo, stuffed pork chop, beef cutlet, chicken katsu, Hawaiian plate, fish, sweet and spicy spareribs and many more. 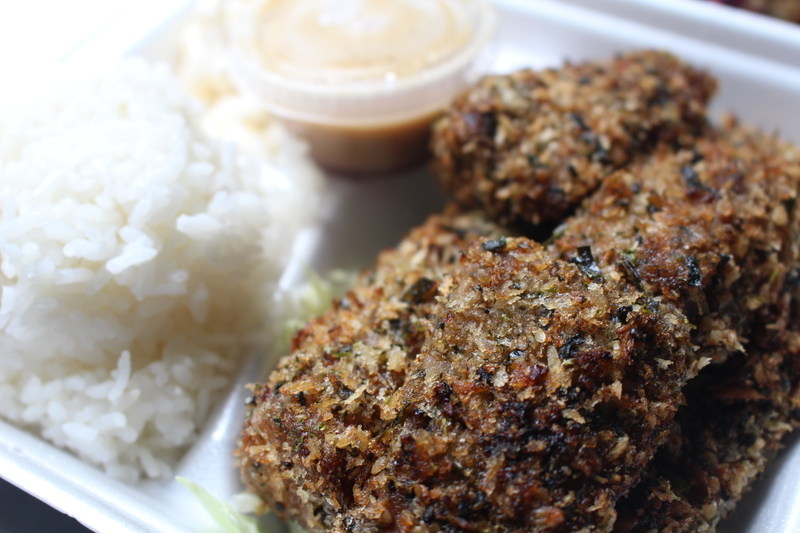 Takamiya switches up their plate lunch special daily which can range from $6.99 to $10.99. 6. 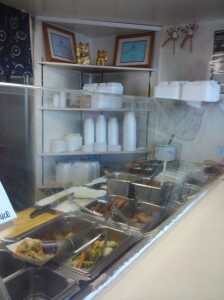 Takamiya Market, 359 N Market St, Wailuku – Located in Happy Valley, this place is known for on-the-go food. 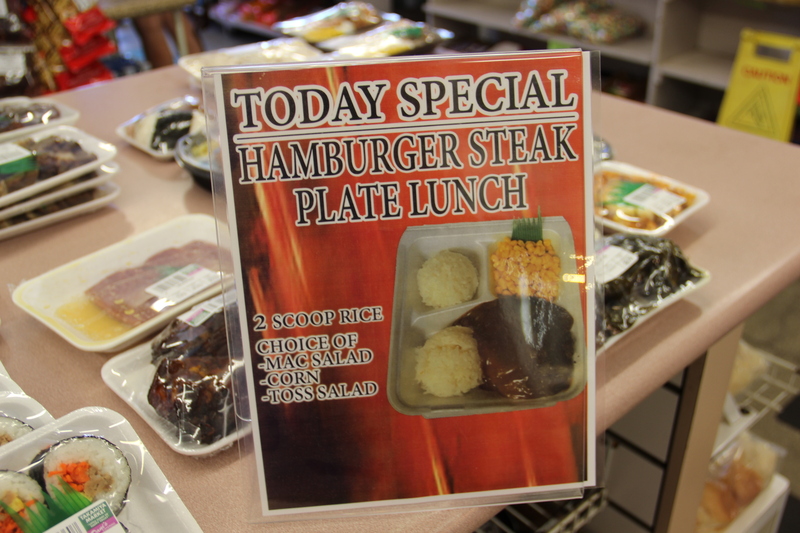 Takamiya switches up their plate lunch special daily which can range from $6.99 to $10.99. However, you can grab a mini hamburger steak plate or kalua pig plate every day for $4.99 (one scoop rice, corn or mac salad), or a regular plate for $5.99 (two scoops of rice, corn or mac salad with more portions), or the jumbo for $7.99 which comes with three hamburger patties for the steak plate and three scoops rice or 8-9 oz. of kalua pig with three scoops rice. Daily specials here can include kalbi ribs, Hawaiian plate lunch, shoyu chicken and pork spareribs, to name a few. 7. 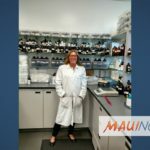 Tamura’s, various locations – Tamura’s is most known for their poke selection but at certain locations, they have a hot plate lunch counter where you can grab a plate lunch for under $10. 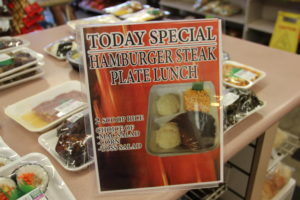 At the Kahului location, they have roast pork and hamburger steak served daily for $8.95. Daily specials vary, but can include shoyu chicken, beef stew, charsiu chicken, and fried chicken for $9.95. 8. Piko Café, 1215 S Kīhei Rd – This new place in Kīhei has cheap prices and delicious food. They have a breakfast special that comes with two scoops rice, two eggs, and choice of meat for $5.99. All plate lunches here are served with one scoop of rice, mac salad and side of cabbage. BBQ chicken, chicken katsu, mochiko chicken and hamburger steak come in at $8.99 and teriyaki beef is available for $9.99. They even have Piko Bowls if you’re on the go that come on a bed of rice with cabbage. 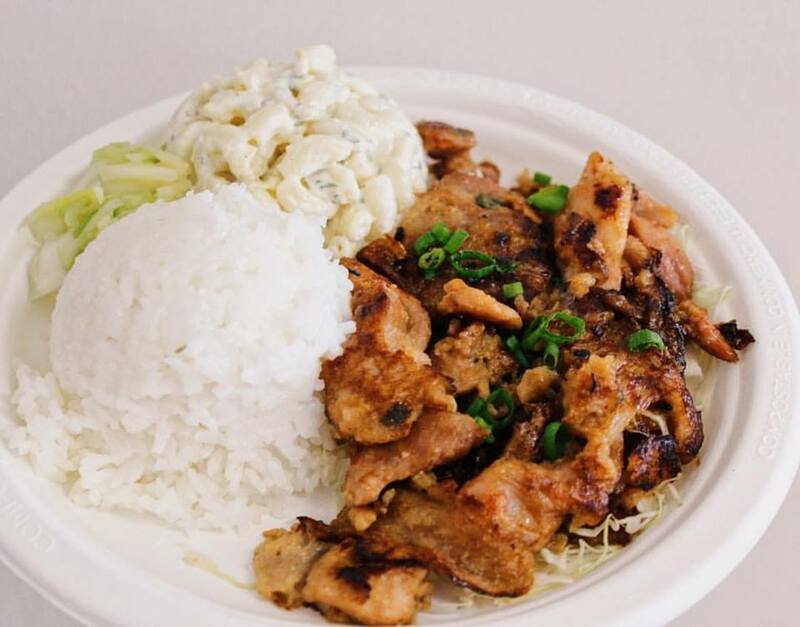 Piko Bowls can include BBQ chicken, chicken katsu, or mochiko chicken for $6.99. The teriyaki beef bowl is $7.99, chop steak bowl for $8.99 and the Mahi Mahi bowl is $10.99. 9. Nagasako Okazu-Ya Deli – 845 Wainee St #213, Lahaina – Known for their Spam Musabi, this hole in the wall in Lahaina has some of the best prices on Maui for local food. 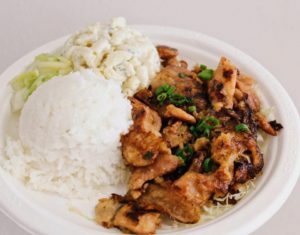 Shoyu chicken, teriyaki beef, chicken katsu, roast pork, roast beef, and pork adobo come with two scoops rice and mac salad for under $10. 10. Tin Roof Maui, 360 Papa Pl, Kahului – Former Top Chef contestant and fan favorite Chef Seldon Simeon runs this joint in Kahului where you can get one of the Kau Kau Tins with mochiko chicken or chop steak for $8, or pork belly and garlic shrimp for $9. Technically, it’s not an official plate lunch since the tins come with white or brown rice and a side of the day, however, for $1 you can buy the ulu mac salad (made with steamed diced breadfruit) and it would still be under $10. The best part? You can order and pay online and walk right in and grab your food within seconds.